This is a story about two women. They're not professional athletes. They're not famous. They're just two friends. Back in the 1980s, Caroline Steer and Vanessa Oshima went to high school together in a small town in New Zealand called Matamata. Vanessa says, when she and Caroline were in school together, they were both into sports. But Caroline remembers things a bit differently. "I was incredibly unfit. I was notorious for hiding from cross country, and I would have told you back then that I can't run," laughs Caroline. "It's just an impossibility." After high school, Caroline and Vanessa went to different universities. Vanessa moved to Japan. Caroline stayed in New Zealand. The two fell out of touch, as friends living apart sometimes do. Fifteen — maybe 20 years went by before they found a reason to connect again. "It started with Caroline, she'd seen on Facebook that I'd had a great day running," Vanessa says. "And she sent a message saying, 'I was having a bit of a crappy day, but now I feel inspired to actually go out and try something.' So I messaged back and said, 'Well, hey, what's going on?' And she said, 'Well, I've just been diagnosed with cancer.'" "The first chemo session kind of hit me like a ton of bricks, so I was thinking about diet and exercise and what can I do to make the whole chemo process easier," Caroline says. "Just seeing her running was, like, 'That's so awesome. Maybe that's, you know, that's part of the puzzle.'" "'Well, hold on, that's easy,'" Vanessa remembers saying. "'What? Me running makes you want to go fight this? I'll run. And I’ll run until you’re done.'" Vanessa promised to run every single day for Caroline — and jogging down to the end of the block and back wouldn’t count. She’d run at least 5 km — that’s 3.1 miles. And she’d do it outdoors, because running on a treadmill was just too easy. "People who are fighting cancer don't get to choose that," Vanessa says. "They don't get to say, 'Oh, you know what, today I think I'll just treadmill it.'" 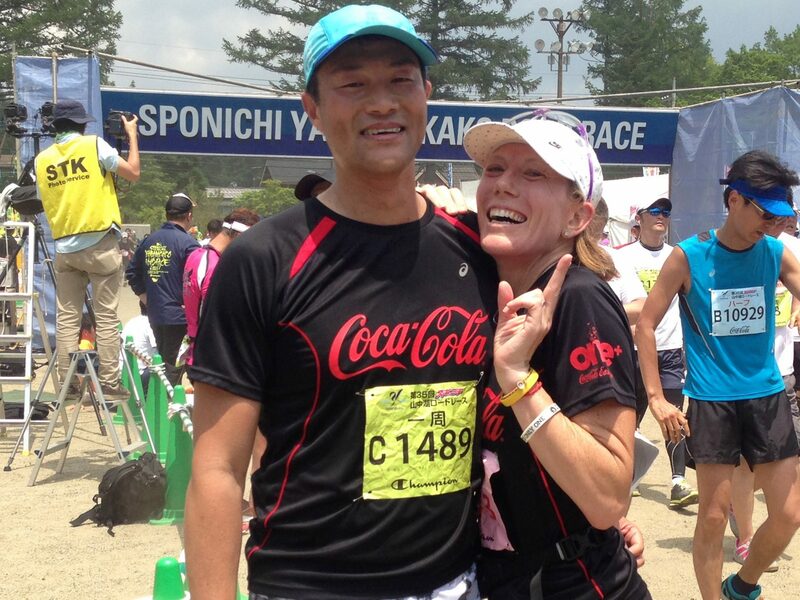 Vanessa’s husband, Yasu, is a cancer survivor, so she knew she’d be at it for a while. She figured maybe two or three years. Caroline says, right from the beginning, it made her feel better to know that Vanessa was going to all this trouble — for her. And she made her own promise. "To start off, for me, it was 20 minutes every day of, for example, walking up and down my road," Caroline says. "But over time, I actually started to run. Although my husband did describe my running at first as an animated wobble. But it was my animated wobble." While Caroline was perfecting her "wobble," Vanessa ran every day for 50 days — then 100. 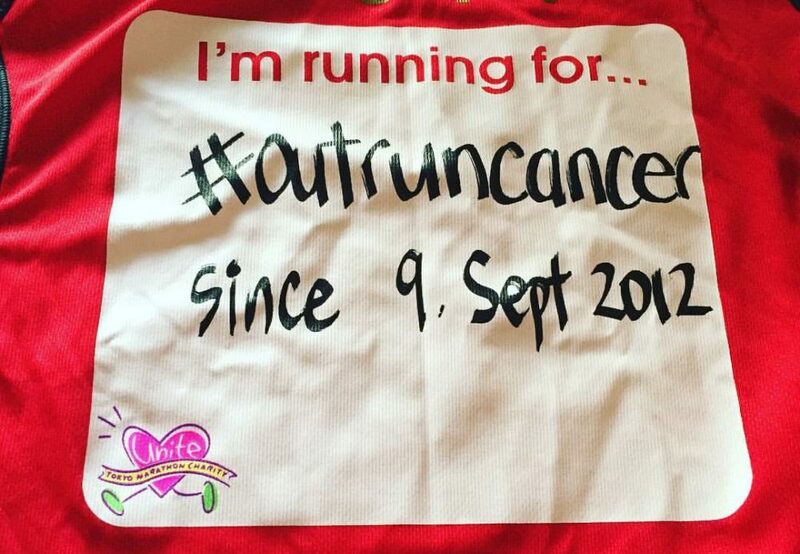 She’d post updates on Facebook after every run, using the hashtag #outruncancer. "She was a big part of what got me through my dark time, my treatment and the tough time," Caroline says. "She gave me something that really made me smile, you know. I looked forward to her posts, 'What's Vanessa doing today? What's the next installment?'" Soon, Vanessa started recruiting friends who wanted to #outruncancer, too. They’d each commit to running every day for 50 days. And even though they’d never met Caroline, they all ran for her. "I remember one day — it was Day 200. And we decided to do a run all together," Vanessa says. "And we ran in the park, and it was cherry blossom season. And we skyped her because she was still in the middle of chemotherapy. And she cried on the skype call. And she said, 'It's just amazing to know that people I don't know are doing this for me.' I think that was when it started to hit us that we were doing something special." Caroline finished chemotherapy and began hormone treatment on Day 259. Vanessa kept running. She ran through a typhoon. She ran through injury. A year went by. Then two. Then three. Along the way, Vanessa raised $16,000 to fight cancer. After a while, even though she was healthy, Caroline wasn’t able to keep up her daily runs – or wobbles. Work and life got in the way. But on Day 1,000, she flew to Tokyo and she and Vanessa ran together. "And I'd always said to her, 'Look, anything I can do, ever, I'm here for you. And of course, if the same was to happen to you, I would run every day for you,'" Caroline says. "To be honest, I always thought, 'No, Vanessa's so healthy. She'd never get anything like this.'" But after more than four years of running every day to #outruncancer, Vanessa started to feel like something wasn’t quite right. At first, she thought maybe she’d just pulled a muscle, but when the feeling didn’t go away, she decided to go in for her yearly mammogram a little early. "The doctor, immediately, as soon as she saw the mammogram, she said, 'This is, um, not good,'" Vanessa recalls. "And I was, like, 'What? Hmm? What do you mean, not good?' And she goes, 'Well, we need to do a biopsy on this one.'" "By the time the biopsy came back, were you ready for bad news?" I ask. "Oh, god, no," Vanessa says. "I was ready for good news. The doctor came back and she was so blunt, bless her soul, but she goes, 'OK, so, you have cancer.' And I was like, 'Oh.'" "At about 11:20 at night, and we — we chatted, and I tried to be as supporting as I could," Caroline says. "And, um, then I got my nightlight on my phone and I went for my first run. That night." "It felt like the beginning for me all over. Just..it took you back to, 'I know where she's at. I know what she's going through and, you know, I need to — I need to support her as well as she supported me.'" At first, Vanessa says, she tried to hide her pain from Caroline. Before long, she realized she didn’t need to. When Vanessa had questions about what would happen next, she called Caroline. When she felt like she was going crazy, she called Caroline. "Cancer for me, at least ... it shakes your confidence. You think you're this healthy person, and suddenly — you're not." Still, two days before Vanessa was scheduled for surgery, it all got to be too much. She was running in the park with her husband and she started crying. She couldn’t stop. "And he said, 'What's wrong?'" Vanessa remembers. "And I said, 'You know what? For four years I've been using this hashtag, #outruncancer. And you can't outrun it. It catches you. It caught me. It caught Caroline. It caught you. So what's the point? It doesn't matter how we do this. I can raise all the money I want. I can — you know, I can't do it.'" It was the closest Vanessa had come to quitting. But her husband, Yasu, encouraged her to try to keep going for just one more day. And soon she wouldn’t have a choice. 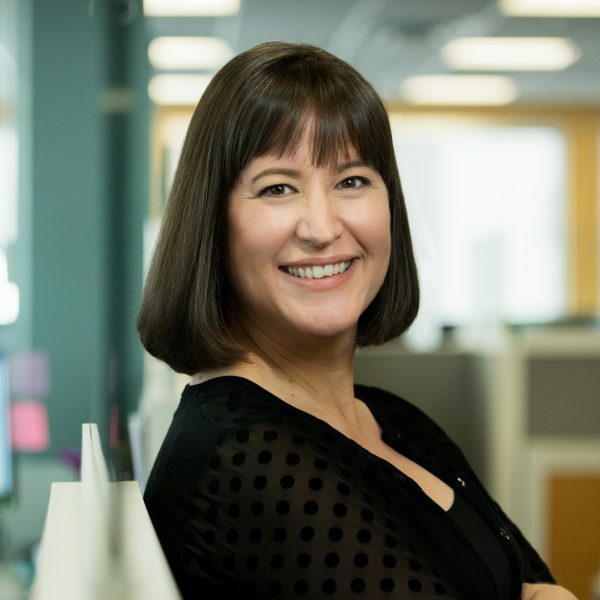 Vanessa and her doctor decided on a radical mastectomy and lymph node removal. They hoped that with this surgery, Vanessa would be able to avoid chemotherapy. But her doctor said it would likely end the streak. "I think it would have been one thing if I had broken a bone or an injury and it's like, 'OK, I'm stopping for injury,'" Vanessa says. "But the pain of the streak that was all about beating cancer is stopped by cancer, just it didn't sit well with me. But I needed to come to terms with it, and I — I kinda did. So I was – I was almost at peace with ending it." Vanessa went for a run at 4:30 on the morning of her surgery. When it was done, she sent her running shoes home with her husband. At 10 the next morning, Vanessa’s doctor came in to check on her. "And she's like, 'Well, you know what? You could be OK to do a slow jog indoors. You're not going outdoors. Be close to where the nurses are. Don't break a sweat. Don't use your arms. You'll be OK,'" Vanessa says. Vanessa immediately texted Yasu and asked him to bring her running shoes back. But, for the rest of the day, she couldn’t bring herself to put them on. "Cancer for me, at least ... it shakes your confidence," Vanessa says. "You think you're this healthy person, and suddenly — you're not." "At 8:30, I thought, 'Let's try.' And so I put on my sneakers, and I ran 42 laps in front of the elevator bay," Vanessa laughs. "Backwards and forwards, backwards and forwards. There were tears. I don't know if they were tears of sadness or elation or just tiredness, but there were tears. And questions, 'Why am I doing this? Is this the right way to tackle this?' Doubt. Yeah. So I wouldn't say it was a good run, but it was a small victory to say, 'You know what, cancer? You didn't stop me. Try again.'" Like with so many of her runs, Vanessa posted an update on Facebook. It began, "April 1, 2017 – I have 1663 days of running 5 km." "One day I will not run. Today was not that day. #outruncancer"
"There's so much energy you have. You can use energy to find an excuse not to do something," Vanessa says. "I can give you 10 million excuses why I'm not going to run, you know, I got a busy day today. It's raining. I've got cancer. I could give you 10 excuses to not run. All you need is one to do something. And I think Caroline became that one reason for me." "I have run every — every day without exception," Caroline says. "I'm still not a runner. There's no grace, there's no speed. I do my run each night and I come back feeling better for it." "She always used to say to me that it was really great having me run for her," Vanessa says. "And I thought that she was being 'nice.' But now that I'm going through it, I get it. I wake up in the morning and I see on Facebook, 'Hey, Day 99 ... 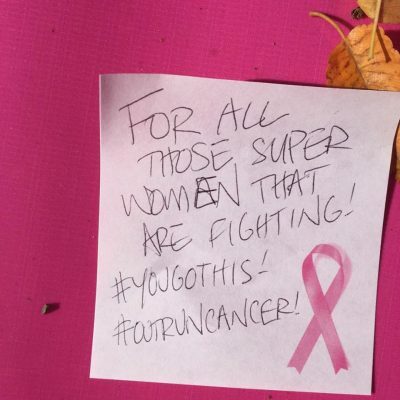 #outruncancer.' And I get it." "Well, her commitment to me was until I'd finished my treatment. And my commitment to her is ... the same, I guess," Caroline says. "But, um, you know what? I'm kind of enjoying the run for the run's sake. So...I don't know. Part of me thinks, 'As long as you can run...run.'" 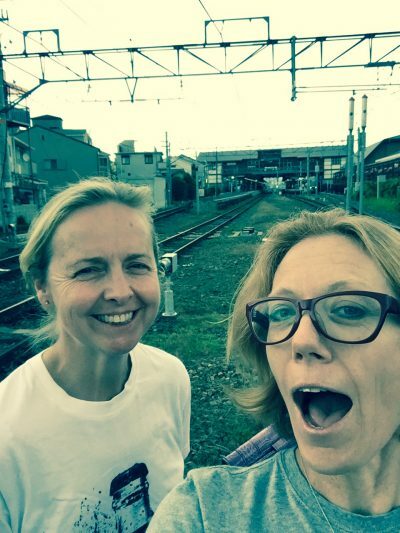 Friday was Day 115 of running everyday for Caroline Steer and Day 1,739 for Vanessa Oshima. There will be a day they do not run. But today is not that day. This segment aired on June 17, 2017.